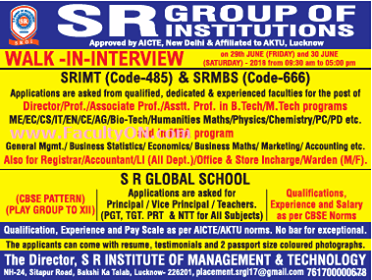 SR Group of Institutions, Lucknow has advertised in THE TIMES OF INDIA newspaper for the recruitment of Professor/Associate Professor/Assistant Professor jobs vacancies. Interested and eligible job aspirants are requested to appear walk in on 29th , 30th June 2018. Check out further more details below. About College: S R Group was started with the estabLishment of S R Institute of Management and Technology offering B.Tech program with 4 branches and 240 seats in the year 2009 by the chairman Shri Pawan Singh Chauhan under S R educationaL Trust and is dedicated to Late Shri Subedar Singh and Late Smt. Raj Devi, who inspired their son. Subedar RaI Devi Educational Trust founded in the year 2008 is registered under the society registration act of 1860. It was in 2010 when S R Group of Institutions came into existance with establishment of S R M Business SchooL for MBA program with 120 seats. New courses Like PGDM, IMBA (MAM), Bio-Tech, AgricuLtural Engineering etc. were introduced under these institutions.The S R Group is spread across 60 acres of Land.